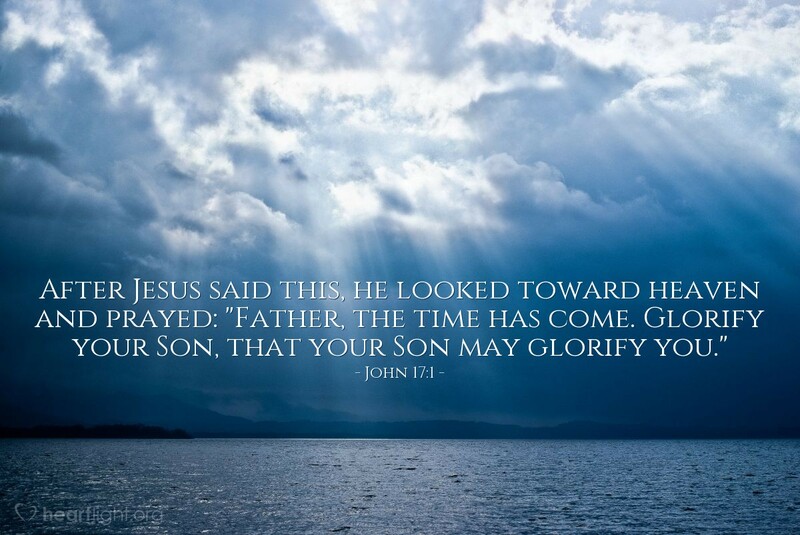 John 17 is one of the most moving chapters in all the Bible. Jesus knows he is going to die. He knows he is spending his last few hours before his death with disciples who do not understand what he is about to do and why he is about to do it. Jesus has two key goals in mind as he prepares himself, and his disciples, for their life ahead without him. He wants them to be one so they can remain strong and influence the world for God. He wants what he does to bring glory to the Father. While he faces humiliation and abandonment, his desire is to bless others. We are going to face hardship. What will be our goal? Hmm, no wonder we are reminded to fix our eyes on Jesus and follow his example. Loving Father, I cannot fathom the mysteries of anguish and grace that touched your heart as Jesus made his way to the Cross with such honesty and selflessness. Lord Jesus, I cannot thank you enough for leaving me a powerful example of how to endure life's heaviest burdens. Please make my life a blessing to others and give me courage to serve and to bless even in times that are hard. In Jesus name I pray. Amen.